In the clearest signal yet that the PBOC is drawing a "red line" to further currency devaluation, moments ago the PBOC announced it is raising the reserve requirement for FX forwards to 20%. As the PBOC notes, "due to factors such as trade frictions and changes in international exchange markets, there have been some signs of procyclical fluctuations in the foreign exchange market." 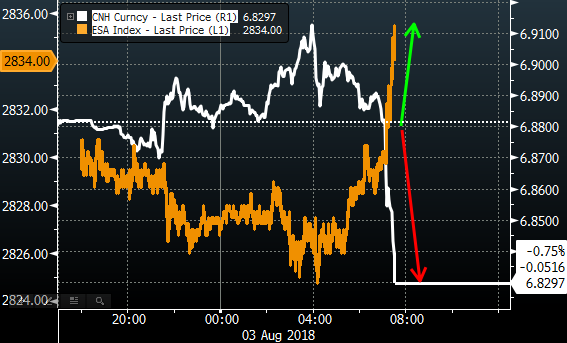 As a result, the move is "aimed at preventing macro financial risks" with the central bank adding that it will "take counter cyclical measures to keep FX markets basically stable based on market conditions." The new forward foreign FX risk reserve requirement will become effective as of Aug. 6th. Reuters is also reporting further “interventionary” commentary from the PBoC regarding willingness to take further “counter-cyclical” measures to stabilize FX markets. "In the even-larger macro-sense, this is unambiguously a relief trade for risk-assets via the powerful “weakening USD” impact it can have—ESPECIALLY Emerging Markets and Commodities, which have again recently traded VERY sloppy" according to McElligott, who adds that "we see S&P futures rallying powerfully, as “stronger USD” has been a pure “tightening” of financial conditions." The Nomura strategist accurately concludes that "the PBoC just “eased” U.S. financial conditions." And sure enough, as the Yuan slides, S&P futures are surging. The People's Bank of China decided to adjust the foreign exchange risk reserve ratio of the forward sales business to 20%. Since the beginning of this year, the foreign exchange market has been operating steadily. The RMB exchange rate has been based on market supply and demand. There has been a rise in the market, the flexibility has been significantly enhanced, the market expectation has been basically stable, and cross-border capital flows and foreign exchange supply and demand have been generally balanced. Recently, due to factors such as trade frictions and changes in international exchange markets, there have been some signs of procyclical fluctuations in the foreign exchange market. In order to prevent macro financial risks, promote the stable operation of financial institutions, and strengthen macro-prudential management, the People's Bank of China decided to adjust the foreign exchange risk reserve ratio of forward sales from 0 to 20% from August 6, 2018. In the next step, the People's Bank of China will continue to strengthen the monitoring of the foreign exchange market. According to the development of the situation, it will take effective measures to carry out countercyclical adjustments, maintain the smooth operation of the foreign exchange market, and maintain the basic stability of the RMB exchange rate at a reasonable and balanced level. Obviously the reversal of this move would have just as dramatic a move in the opposite direction, and sure enough, after hitting a one year low of 6.91 against the dollar, the CNH has surged massively, rising as high as 6.825 before finding some support. And yet, as some traders already noted, there will be a cost to China in terms of the impact of what is effectively policy tightening will have on domestic liquidity. Specifically, as Citi notes, "the local economy and asset markets will struggle to cope with that and it is not a sustainable policy." 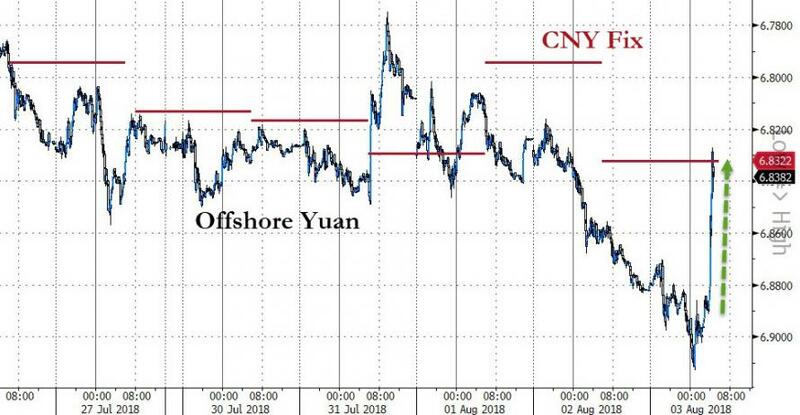 And while Trump may be content that for now, at least, the PBOC has finally drawn a real line in the sand for further devaluation, he will be double happy that China no longer will permit Yuan devaluation as a currency war response to rising tariffs, effectively handing Trump leverage in the trade war, if only for the time being.